Welcome to the website of the world's leading manufacturers of Forced Action Pan Mixers, designed and built in our UK factory to BSI Protocol and CE marked for worldwide sale. CreteAngle® design and manufacture the leading range of Forced Action Mixers. Contact us for a quotation today. “Creteangle” Pan Type Mixers were first developed for use in our own concrete works. In 1956, having greatly improved the quality and speed of mixing, we commenced production of “Creteangle” Mixers to other concrete works. 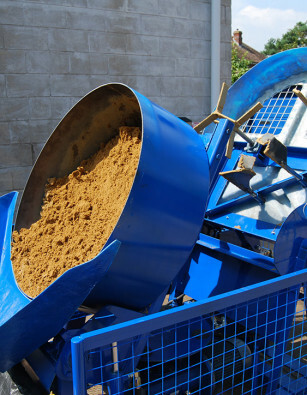 Since then, the development of new materials requiring fresh techniques for mixing has been the forefront of our experience, and we are always willing to advise and demonstrate special adaptations to our mixing machinery. Proven for mixing a wide range of materials with reliability the key word, we offer the best in mixing to meet today’s market. All models are of steel construction and are manufactured to very high standards. The mixers are shaft-driven by enclosed fan-cooled motors, or suitable petrol/diesel engines. Centrifugal clutches are supplied as standard where necessary. The gear boxes are matched for the application and are totally enclosed, running in oil for trouble-free operation and long life. There are no belts or pulleys used so replacements at regular intervals are alleviated. All blades and paddles are ‘hard faced’ on the contact edges to resist wear on abrasive materials. Pans are heavy gauge steel and there are no projections or fixed blades, etc. in the pan, thus the pan can easily be kept clean. “Creteangle” Mixers are guaranteed for a period of one year from the date of delivery. Any part returned to our works which has failed due to faulty workmanship or material within the above mentioned period, will be replaced free of cost. Parts or components not manufactured by us are subject to such warranty as is given by the makers thereof.